You are back already - yeah! I love your blog. Great collection of glitters. Perfect for that start of the holidays feeling. Love it! I love the random glitter spam, it is hard not to stare at glitter! Wow that INP Green Glitter looks fantastic! Where can you buy that??? Yay! As I was coming home from work, I stopped by the grocery store for some shampoo, and to my surprise they had just ordered a WHOLE bunch or Sally Hansen Hard as Nails Xtreme Wear polishes! Is the Sally Hansen gold new or an old one? That green glitter is awesome! OOOOh yea. Glittery goodness. A girl can never have enough glitter and this is a perfect example. Why did this post make me feel soo excited/warm&fuzzy/proud to be a woman? Oh yea - because glitter rocks! Luv u scrangie for the glitter mainline fix. what is your fave stand-on-its-own glitter of all time? 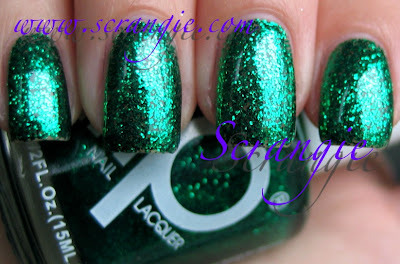 Holy crap... where do you find Inp Nail Lacquer 99 Green Glitter??? Did anyone find out where to buy the INP Green Glitter?!?!?!?! Did anyone find out where to get the INP Green Glitter?!?!?!?!?! China Glaze Starfish Wish is lovely! I just can't get over how perfect your nails are. Source puh-lease...there's no vaccine for this one. I recently found my Naturalistics Holiday Red Glitter... from 1998? 1997? Had to revive it.. but it's still nice! I love China Glaze Fairy Dust!!! simple but elegant! Strobe Light is amazing over a black base. I need to find 14 Karat. Somehow, gold is completely missing from my collection.